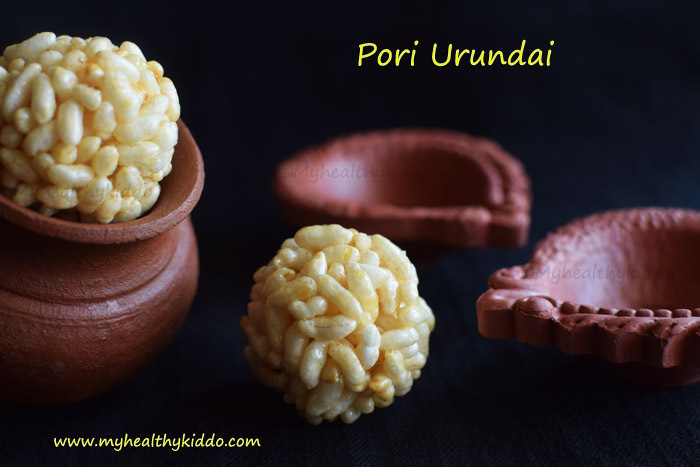 Pori urundai is a sweet ball made using puffed rice and jaggery for karthigai deepam. It is an iron-rich after-school snack too. 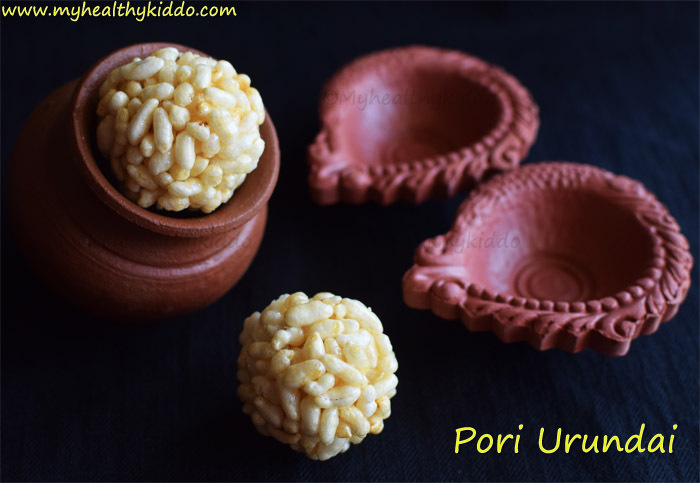 Pori urundai brings back lot of childhood memories. A big bag of pori urundai will be hanging in every corner shops/Mukku kadai(Theru munai kadai)/Annachi kadai/Petti kadai 🙂 We get 2 for 50 paise. We always get two and hold one in each hand. We don’t finish one by one, though. We have a bite from right hand pori urundai and the next bite is from left hand pori urundai. Before we reach home, we finish half in each hand. The master plan was to save the pori urundais from siblings. Echa pandra technique 🙂 How silly !! This step is not required in India, as we get crispy fresh pori there. In US, puffed rice is packed and mostly not crunchy. If your pori is not so crispy, then fry it in dry pan in low flame until it turns crispy(eat few and check). It roughly takes 2-3 mins. 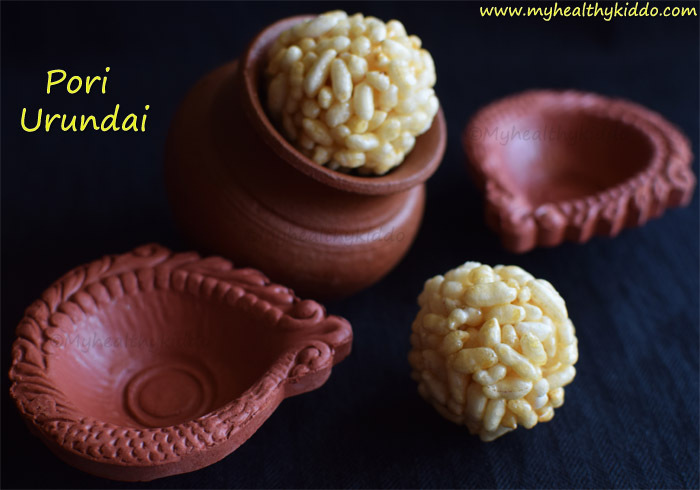 Add ½ cup of grated jaggery to a pan along with ¼ cup water and boil until jaggery gets dissolved completely. Filter the syrup to another pan. Add ⅛ tsp cardamom powder and allow it to boil in medium flame until nicely bubbles up and becomes slightly thick. In a bowl of water, pour few drops of syrup. Gather the syrup and roll between fingers to form a soft but firm ball. The ball should not easily glide out of your finger(The previous stage of soft ball consistency). It should be firm enough to hold its shape, but soft to press. Add puffed rice/pori and cut off heat immediately. With a ladle, mix well so that pori coats well with all syrup. Once mixed up, use a spoon to take out the pori stuck to the ladle, else it will be difficult to take at the end. Grease your palm with ghee and pinch out a small portion. Shape into ball with the greased fist. Be gentle and do not break the pori. Repeat this to make all balls. Last few pori might stick to the pan. Reheat the pan for few seconds. The syrup will melt and the pori will easily come out to make the final balls. 1.No issues if the syrup slightly crosses soft ball consistency. But, do not start making before the syrup reaches soft ball consistency as it will make the balls so chewy. 2.Store in airtight container for a week. 3.Make the balls as fast as you can. Reheating more than once will affect the ball quality. 4.If you are making alone without any help, do not make more than the mentioned quantity as you might not make the balls faster and end up in more reheating !! 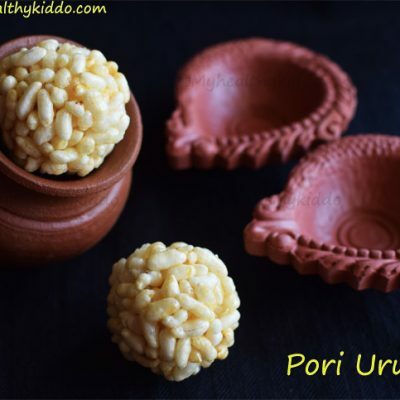 Preparation – How to make pori urundai? No issues if the syrup slightly crosses soft ball consistency. But, do not start making before the syrup reaches soft ball consistency as it will make the balls so chewy. Store in airtight container for a week. Make the balls as fast as you can. Reheating more than once will affect the ball quality. If you are making alone without any help, do not make more than the mentioned quantity as you might not make the balls faster and end up in more reheating ! !